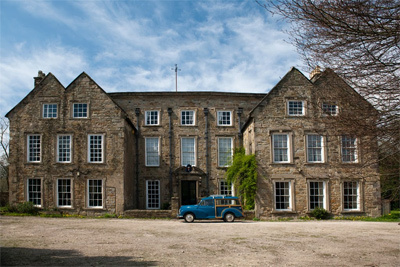 Carnfield Hall started its life in the 1470’s when Dame Alice Babington moved to the area and built the house. Dame Alice’s cousin, Edward Revell, decided Canrfield needed more space and created two floors above the Hall, lowering its ceiling. It seems he secured the house for himself in 1498 by treacherous means. He and his brother attacked the house and kidnapped Dame Alice’s husband, intimidated everyone with a claim to the home, and kept it for themselves. In the 1690’s Robert Revell, who had inherited the house, was made High Sheriff of the county. In spite of his lofty position, he, too, had rebellious servants. But they went a little further and, in 1714, murdered him. His daughter inherited the home but died without children, and the Reverend Francis Revell came into its possession. However, his morals weren’t quite what you’d expect of a man of the cloth. He not only lived in the house with his wife and children but made room for his mistress as well. It is rumoured that their ghosts are still playing on the grounds. When Graham Oliver and his partner Heidi bought Carnfield Hall, in February 2011, they experienced all sorts of unexplained noises, thumps and doors shutting. The most inexplicable was very faint Harpsichord music being played in the upstairs parlour. Experts reportedly attended and recorded the music. They concluded it was from an organ harpsichord, the Rolls Royce of all harpsichords, and really quite rare. James much later, discovered in an inventory, a mention of an organ Harpsichord in the dining room in 1717. this had been a wedding present for Frances Revell as she had married Mr. Francis Peg. By closing the right doors and playing a recording in the room we were able to record the same level of sound in the parlour. The north east bedroom has a history of being haunted going back at least a hundred years, nobody knew why. About eight years ago It was discovered that Robert Revell, the Squire, was “murdered in his bed by two of his servants”. This story had been lost over the centuries and was found on an old family tree. Both Graham and Heidi and their guests have heard the furniture being shifted when in the library below and footsteps across the drawing room, of course, with no one there! Another group were locked in by an unseen hand ferociously rattling the door handle, all occupants of the house had been accounted for so who was it? Several people related to the 19th century servants have told of three children in 18th century costumes (two girls and one boy) who play ball on the south lawn and fade into the dusk. Apparently the staff often used to wait for it. It is presumed to be Tristram Revell and his two sisters Mary and Bazina in the 1740′s. Another story is of a ghostly coach seen in the fields west of the Hall by various servants heading home in the dark to their houses in Alfreton in Victorian times. What they didn’t know was that the Hall was reversed in about 1700 and the main drive to the old front of the house was that on which the coach was seen: Is this Robert Revell’s coach? One lady said her mother had told her it had two huge wheels and two small, a perfect description of coaches of the late 17th / early 18th century. Various visitors and guests have said they have seen figures out of the corner of their eyes. And two, unrelated guests, on separate occasions both described the same ghostly religious figure sat in a window seat in the dinning room. A builder here once heard someone walk in heavy boots across the attic when he was painting the parlour ceiling, a few inches above him. He was alone in the house at the time and mindful of burglars had locked himself in! The carpet fitter was found sat outside the house refusing to re enter alone as a lady had been talking in the adjacent room, which, you’ve guessed, was empty. A Bamfords auctioneer refused to discuss what he had heard, but as the house changed hands and antiques were sold off, he left the house, unsecured and refused, ever, to re enter it. An amusing local story is that a ghost ball takes place here every year in the great parlour on the anniversary of the ball given in 1700 by Robert Revell when he was High Sheriff of Derbyshire. In the 1960/70’s the police quite often came out to Carnfield Hall, called by concerned passers-by who had seen flickering lights in the windows. It was easy to get in but no one was ever found except the smell of candle smoke. A mark at the end of the drive painted on the wall warned tramps never to stay;presumably one had spent the night and was unnerved, so kindly marked the gate.